Bloodshot has been around for a while and after multiple stories, one big one is being told. Bloodshot: Rising Spirit #1 starts to tell the story of how Bloodshot became Bloodshot. Bloodshot has been around for a while and after multiple stories, one epic tale is being told. 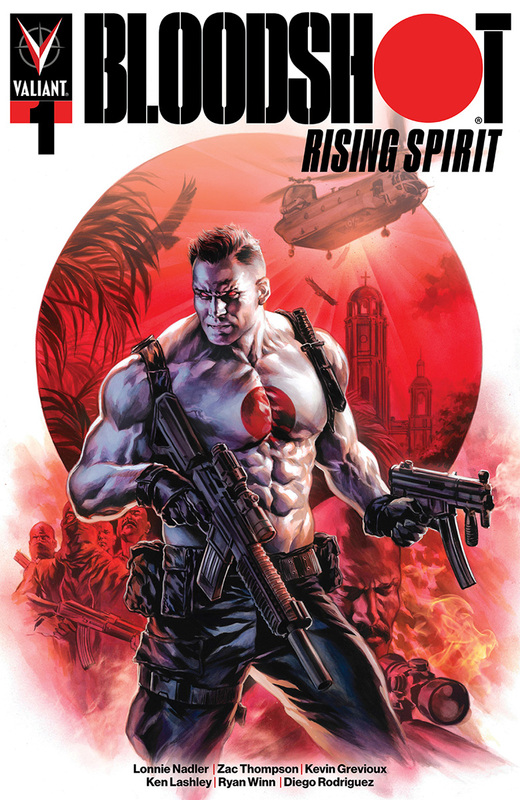 Bloodshot: Rising Spirit #1 begins to tell the story of how Bloodshot became Bloodshot. Bloodshot was once a hit man for the mob. After a botched hit, he is invited to join Project Rising Spirit and become the perfect weapon. Bloodshot is injected with nanites and after he is injured in a training exercise, he starts to rapidly heal. After he receives his first mission, it goes terribly wrong…. Lonnie Nadler and Zac Thompson tell an interesting tale. To see Bloodshot as a hit man for the mob is a unique take on the character. Past tales have had Bloodshot as a military man with a family. Rising Spirit is a way for Bloodshot to redeem himself and also continue to do what he does best. This man has lived his life surrounded by violence and it is all he has ever known. I really like this take on the character that Nadler and Thompson deliver. The art by Ken Lashley fits the tone of the story well. The panels are wonderfully drawn and enjoyable to look at. The character design of Bloodshot fits the unique take on him. This book has a lot of action sequences and they deliver. The panels that showcase Bloodshot training are fast paced and they are exciting. I also enjoyed seeing the regeneration process that Bloodshot goes through after he is injured. I look forward to seeing more from Lashley in this series. The one negative takeaway from this book would be that I would have liked to see more from Bloodshot’s past. I enjoyed the fact that he was a hit man and wanted to see more of that. I would have also enjoyed seeing his imprisonment before he joined Rising Spirit. I think that the establishment of Rising Spirit would be worth seeing throughout this series.